In Season 1, Eposide 3 of The Great House Revival, a couple transform a derelict 19th-century schoolhouse in Cavan into a new home by building a timber-clad extension. The property is located on the busy Dublin Cavan road which presented a huge concern regarding noise pollution. 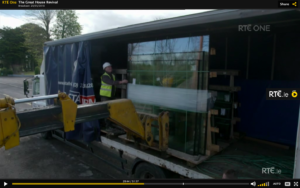 In order to address this problem, they choose Vista Therm triple glazed windows by CareyGlass, for both the very large units and also the traditional timber windows supplied by Dermot Brennan Archworks Specialist Joinery. The ability of the windows to combat the noise problem was critical to the success of the project. Once installed the acoustic properties of the windows is tested and we’re delighted to say that the couple are very happy indeed with the outcome. The Vista Therm triple glazed, argon gas filled units performed exactly as expected, not only by significantly reducing the noise levels but also providing excellent thermal efficiency.